What would it be like to be stuck in a child’s body forever as a result of a genetic abnormality? How do others deal with various conditions that define their lives? How do you reconcile your adult life with your childhood and familial identity? The Condition explores all of these questions with sensitivity and depth. I hadn’t heard about this novel, but while browsing the bargain aisle at Barnes and Noble, the cover caught my eye (and yes, the price tag was a part of that!). Tales about family dynamics always tend to resonate with me, so author Jennifer Haigh and I were off to a good start once I read, courtesy of the back cover, that The Condition “explores the power of family mythologies.” The price (good old B&N probably just had a surplus), the copy on the back, and the fairly oblique title (what exactly is this condition?) made it an easy choice to check out, and indeed, reading the novel was quite the experience. The best feature of The Condition is that it allows the reader intimate and unique access to the minds, hearts, and experiences of the five McKotchs, all of whom live with a condition in their own way. The most obvious condition in this family is daughter Gwen’s Turner’s syndrome – an abnormality that traps her in the body of an eleven year old girl forever. The novel begins pre-diagnosis and then quickly cuts about twenty years later to Gwen, an anthropologist working in a museum, living her adult life but still relationally paralyzed and generally burdened by her condition. Billy, her older brother, is an incredible success as a good-looking NYC doctor and marathoner, but his life is also burdened by a condition of sorts, and he expends great effort hiding a huge aspect of his life from his family. Perceptive readers can probably guess right away what this “condition” is. The book goes into a bit too descriptive detail about his personal life for my taste (while reading a very awkward and uncomfortable two pages in his section, I wondered: why do readers need this information? and really, what the heck am I reading?). Luckily, this is a small, easy to skip portion of the novel – as I said, only a couple pages. A side note – after reading the author interview at the back, I understand why she says “if I stopped to think about how my editor (or my reviewer or my mother) would react to a particular scene, I wouldn’t be able to write at all.” No joke! 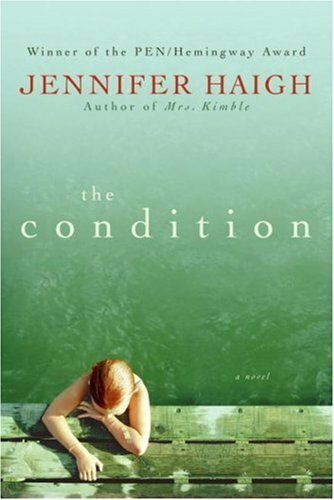 Still, the majority of the time, Haigh handles these characters and their conditions with tact and insight, making the point that we all have our burdens and difficulties. Scotty, the underachieving younger brother, is a teacher with major family problems (loved reading his sections on the job. Even though I am a very different teacher than he is – thankfully! – I could relate to certain aspects). Paulette and Frank, parents of this sibling set, are divorced and dealing with their own character flaws, insecurities, and trials. Overall, reading The Condition was a worthwhile experience, even though I would not go back and reread it: at times, the burdens of all the characters seemed a bit too heavy, and the intense introspective sometimes got a bit repetitive. However, Haigh is particularly skilled at crafting realistic characters: I read that one of her writing methods is to spend months, even years, at sketching characters – their backgrounds, likes, interests, fears, desires, etc – before she even begins writing the story! As a result, her characters are fully realized and insightfully developed. The family dynamics are delicately, devastatingly explored and not cheapened by easy resolutions, making this a relatable and resonant read.